The beautiful document shown below was not made just for commemorative purposes, it is a fine example of Yorkist propaganda. Edward IV, you could argue, like other monarchs from the fifteenth century, had a questionable right to the throne. This particular scroll is seen as the Yorkist dynasties attempt at establishing their legitimacy. It was produced in 1461 for the coronation of the Earl of March as King Edward IV and is just under twenty feet long, and shows the new kings genealogy as far back as Adam and Eve. Historians claim that these kind of scrolls were ‘mass produced’ this would mean that they were given to all members of the nobility so all would know of the royal families connection with God. Apart from the hand painted chart for the gentry, to get his message across to the rest of the country, Edward used posters tacked where all could see them, poems were read and songs sung and if that didn't work there was always the sermon. Symbolism was also a tool Edward used as way of showing divine approval of his cause, he, like the rest of medieval society, believed strongly in the sign...the omen. The most famous one of course, was the three sparkly suns in the sky before the Battle of Mortimer's Cross. From this Edward considered the day to be his and spread the word that it was the Holy Trinity and God was on his side, he also later he used it again, this time it was as a sign telling him to claim the crowns of France and Spain to add to England's. 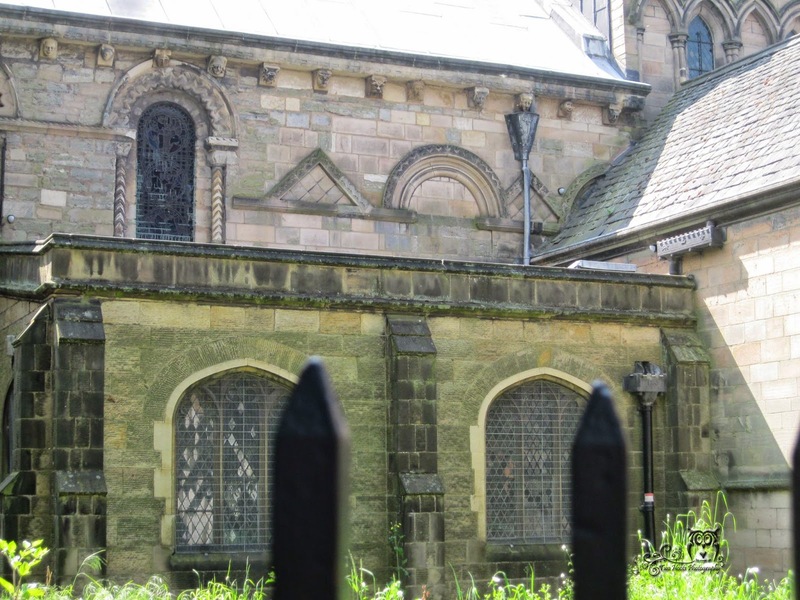 My image below, taken early this year, shows part of the rear of the church, note the lovely line of grotesque heads. Parking our car on the second level of a multi story car park, we could look down on all the continuing building work and see the spire of the Cathedral Church of St Martin in the distance. 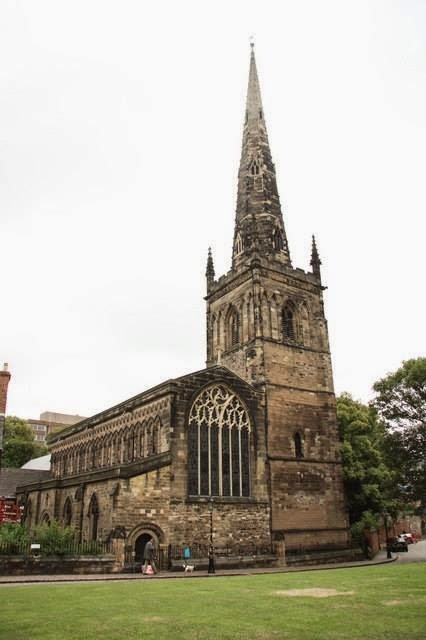 Walking through the newly paved streets we found ourselves in the grounds of St Martins, and standing with our backs to the cathedrals arched entrance we could see Richard III's statue, recently taken from Castle Gardens, standing in front of the entrance to the new visitors centre. This is what we had come back to Leicester to see following a day spent at the re enactment of the Battle of Bosworth the day before. We arrived at are pre booked time slot refreshed and eager. I was amazed how tasteful this new build is and how the glass and the brass effect complemented the red brick buildings of the of Grammar School on its left and the buildings that make up St Martins on its right. The entrance is large and airy and incorporates the gift shop where you can purchase all the books you will ever need if you wish study the the life of king himself. There are a few gift items, and I emphasize the word few, such as mugs, key rings, pencils etc all the things that you usually find in any exhibition and it is nice to see that there is no 'tat' or cheap plastic rubbish aimed at children. should be ashamed of themselves, especially if they have never visited. I had a enjoyable and relaxed couple of hours topped off with a rather nice cup of tea and a slice of cake in the cafe and would give the exhibition four out of five stars only because there were a couple of things that could be improved.........no not improved, tweaked. The writing on the wall above Richards grave is difficult to read, maybe the letters could be in gold, so they stand out more, the area covering the Battle of Bosworth could be a little bit lighter and some audio exhibit are a bit difficult to hear, but that's about it. A letter dated this day, the 18th August 1483 and just a few weeks after being crown king of England, Richard III stayed at Leicester Castle, a Norman creation being built just after the conquest of England. 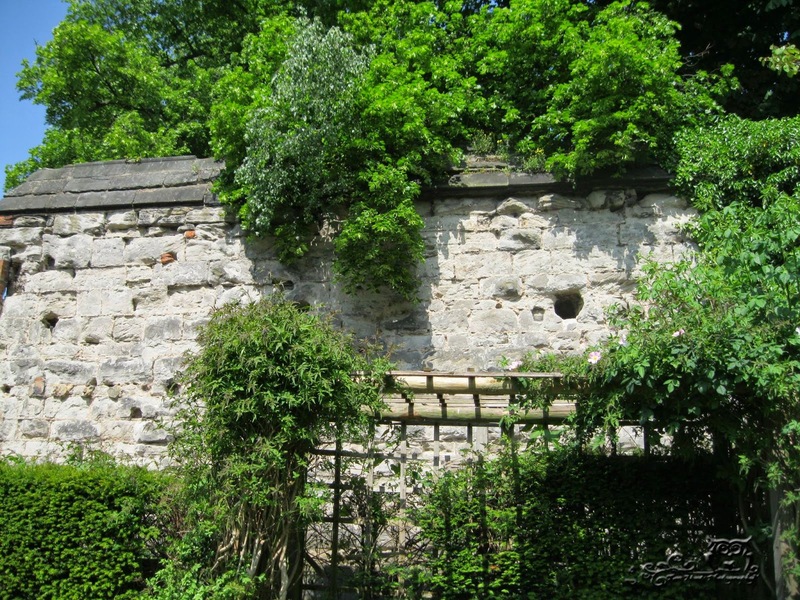 The image seen below is part of the remains of Leicester Castle wall, along with cannon ball holes from the time of the civil wars taken on a trip to Leicester earlier this year. A seventeenth century building, with its bricked entrance conceals the twelfth century structure that Richard III would have known. The Great Hall, was built three hundred years before and was a large open space with timber aisle posts, sadly nothing of this can be seen. 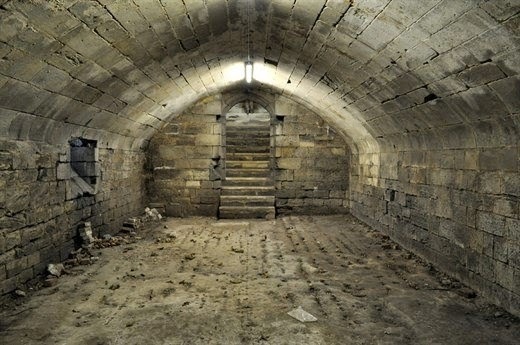 Standing next to the Great Hall is a vaulted cellar known as John of Gaunt´s cellar, also seen below, it is believed that Parliament met here in the fourteenth and fifteenth centuries. 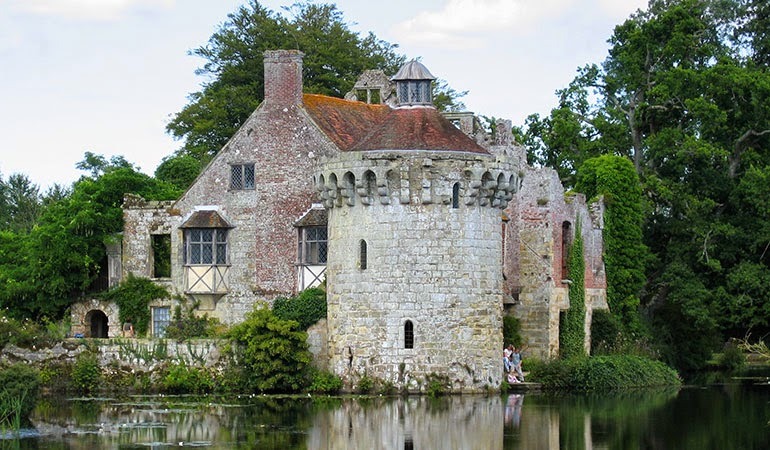 Apart from a visit from Richard III, the hall had received other royal guests such as Edward I, Edward II and Henry IV. On entering the room the raven perches on the bust of a Greek goddess. Staring for a while the man asks the Raven for his name, surprisingly the bird answers," Nevermore." Poe goes on explain that the man consideres the Raven has brought him bad news. The man becomes interested in what the raven means by Nevermore and proceeds to asks of the bird questions such as "Is there balm in Gilead?" "Nevermore." Can Lenore be found in paradise? - "Nevermore." "Take thy form from off my door!" "Nevermore." in the hope that the bird will bring an end to his sorrows. 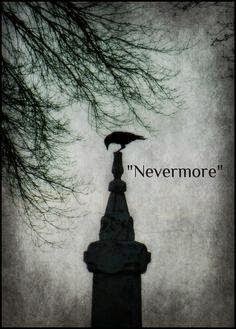 Getting no answer but Nevermore the man at realises that he is defeated and with this understands that he will never deal with the loss of Lenore, this one thought is represented by the Raven who does not move from the statue and continuing to croak the single word "Nevermore." A pointless conversation, and the conflict between desire to forget and desire to remember drives the man insane. In the north of Cornwall, not far from the sea stood Binamy Castle, a mid fourteenth century moated castle the remains of which can be seen on what is known as Binamy Farm. Binamy Castle has had a place in my heart many many years, sadly the foundations of this once fine medieval building and the site on which is stood will soon be surrounded by a large housing estate. 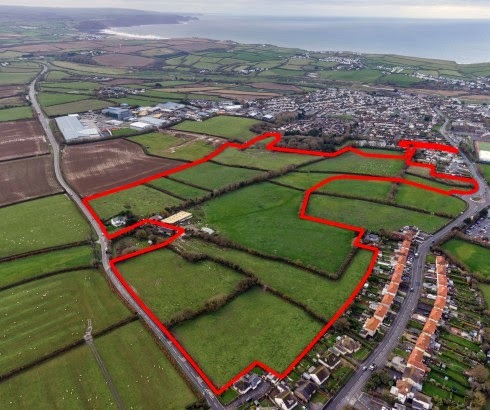 Aerial photograph of Binamy Farm and the housing development surrounding it. Larkin's was commissioned by the Department of the Environment to write a poem to feature in their report ‘How Do You Want To Live?’ His work was used but edited, and lines taken out as controversial or offensive but he later published it if full. His poem smacks of fatalism, it can be said that it is as much about growing old as it is about the environmental issues, but was Larkin right, of course he was, but has any action been taken to prevent or at least control this destructive disease, this creeping concrete? Has the words of this fine Poet Laureate made a difference.